These delicious Mini Bacon, Fig and Goat Cheese Pizzas are the perfect twist on traditional pizza recipes. And at 5 Points per pizza, they are a great idea for a unique Weight Watchers lunch recipe. In fact, these “pizzas” are nothing like the typical pizzas we all know and love, but oh my are they good! The sweet figs and honey balsamic glaze go perfectly with the tangy goat cheese, salty bacon and peppery arugula. Each bite is like a little mouthful of heaven. They also make wonderful Weight Watchers appetizers or party foods and they are insanely easy to make. The high fiber crust helps to make them very filling. I ate two of these and a light salad for dinner one night, and was very satisfied. I’ll definitely be making these Mini Bacon, Fig, and Goat Cheese Pizzas often. Enjoy! 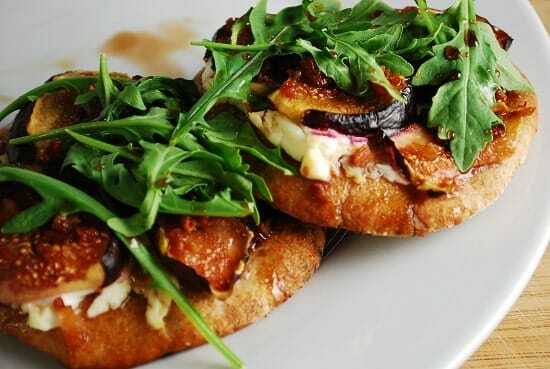 A decadent treat for the dieting foodie, these Mini Bacon, Fig, and Goat Cheese Pizzas are delicious! They work great as appetizers, or as a main course, and they are ridiculously easy to prepare. Place a sheet of aluminum foil over a small cookie sheet or baking tray, and spray with nonfat cooking spray. Place pitas on baking sheet. Spread goat cheese evenly amongst the pitas. Top with figs and bacon bits. Bake oven for about 10 minutes, or until the edge of the pita starts to brown and crisp. In the meantime, heat honey and vinegar in s small saucepan, and warm until well combined and heated through. Remove pizzas from oven and top evenly with arugula. Then drizzle with the honey vinegar glaze and put back in the oven for about another 5 minutes, or until the arugula just begins to wilt. What kind of figs do you use? I used fresh, Mission Figs. Any kind are fine, just don’t use dried figs.